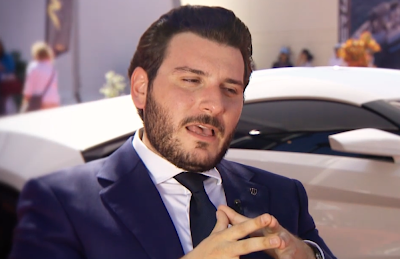 Ralph Debbas, the CEO of W Motors is included in the above video. He is interviewed regarding his company's new sports car the Lykan Hypersport, which along with being one of the fastest cars in the world, is the most expensive. Is it in Mr. Debbas' best interest to be arrogant? Will this behavior sell him more cars? Will it help him sell them faster? Does a condescending emotional tone help with customer service? Would it be any different if he were selling Toyota 4Runners or Chevrolet Impalas? Of course the answer to all of these questions is "No" - and yet his body language projects those feelings. Mr. Debbas' hands are held in what in body language parlance is known as a "High Steeple". Moreover it is a "conventional" sub-type (e.g., in distinction to a basketball steeple, a one-handed steeple, a pistol steeple, etc.). A conventional steeple (high, mid-level or low) is an alpha signal. It signals assertiveness and dominance. Unfortunately like all alpha body language, when it is used, it is very often over-used. It is one thing to project authority and assertiveness and strength using any alpha nonverbal signs, but the audience (whether it is one person or millions) will feel very strongly that the speaker is patronizing and contemptuous if these are used all but a second or two at very specific times. Indeed the conventional steeple must be truly a choreographed gesture. Mr. Debbas significantly over-uses this body language. As if to remove any doubt about his feelings, this CEO dials up his arrogance by the use of contempt amplifiers. Whether standing or sitting, the backwards tilt of the head-neck yields a "nose in the air" appearance - which is a so well established the phase has become an idiom. An additional component in this arrogance cluster is his leaning back in the chair. It's as if to say his audience isn't important and he doesn't have time for them. It sends strong signals of low engagement. Whether selling a product, service or yourself (e.g., your leadership, within the context of romance/dating, etc. ), care must be taken to build rapport and not destroy it - regardless of your price point or your clientele. Mr. Debbas is destroying rapport. Alpha behavior should never be over-done or used to transmit arrogant behavior in such settings; just as being a bit more beta at times does not necessarily send signals of weak leadership (e.g. compassion, empathy, etc.). The World is not nearly as black and white as some believe (and practice) - there many shades of subtlety found in every face and body. Success awaits those who can navigate these nuances.